Vegas Bites 2011 | Eat.Drink.Life.Love. You can get some REALLY bad food in Vegas — any fast food restaurant or $2.99 buffet (and there are a lot of those). You can also get some very good food in Vegas (see last year’s dinner at Bouchon as an example). While the city itself is a Hollywood movie set — inauthentic and a facade — many places have gotten smart about offering food that is reasonably priced and delicious and at least has the name of a well-known chef attached to it (either as a “menu advisor,” frequent visitor or anywhere in between). We were in Vegas for K’s annual family reunion and part of the tradition is a pre-reunion dinner on the town. 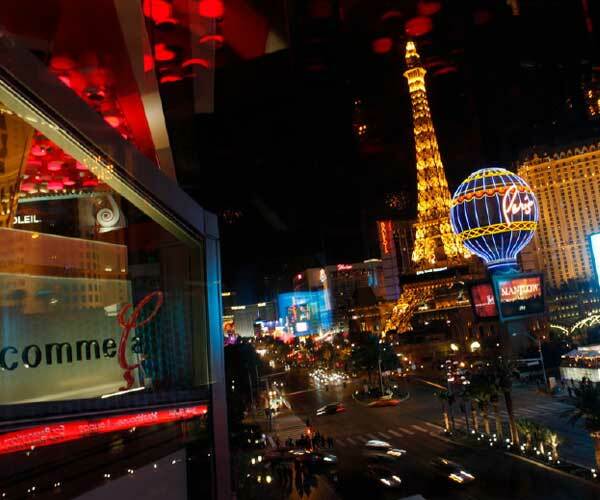 K and I and a group of related reunionites dined at Comme Ca restaurant in the Cosmopolitan hotel and casino. I’d never heard of the restaurant nor had I heard of David Myers, the California chef and restaurateur who conceived of the place. It was a large, dim brassiere, nearly empty for dinner on the Thursday evening we were there. We sat at a large booth with a much-touted view of “Paris” (ha ha, as seen below). But while it seemed sparsely attended, the food was really solid, tasty and very reasonably priced. The server was young and seemed a bit out of her element, but the sommelier was knowledgeable and recommended the perfect bottle of wine at the price point we’d chosen. To begin, K had the duck confit — a rich, perfectly fatty leg of duck entwined with some greenery. I had the crab cake which was chock full of fresh crab and nicely crisp. There were hints of grassy dill in the cake and the red pepper remoulade added a nice little bite. For the main course, K sunk into braised veal breast and a hot potato croquette, both of which he described as “frickin’ awesome.” I had the crispy skate with fresh haricot vert, lemon, brown butter and capers. 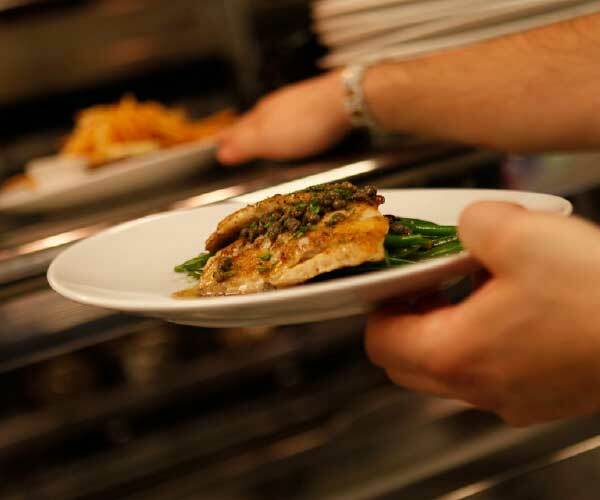 The fish was beautifully tender and the preparation simple and excellently executed — with the butter flavor front and center. No one else at the table wanted dessert, but K and I dug in unapologetically. We shared a calamansi (a type of Hawaiian citrus) custard rolled in a shatteringly crisp tuille and accompanied by rice milk sorbet and candied citrus. It was easily the best part of the meal — elegant, tart and creamy, creative and light. Because Vegas is a temple of indulgence, the next morning I decided to treat myself to a breakfast cupcake at the Cupcakery (in the lobby of our hotel). I was excited about this breakfast cupcake because how often do you get to eat a cupcake for breakfast!?? Never. Nearly all the cupcakes, however, were absolutely slathered in mounds and mounds of sweet frosting, which I did not want first thing in the morning so I went with their Good Morning cupcake (*of course* they had a breakfast cupcake). It was a simple yellow cake with cinnamon topping and a little glaze. It was also a very blah, dry cupcake. According to their website, “nobody makes (cupcakes) better or tastier than The Cupcakery.” That is a bold claim and, based on my experience, they are wrong. We gathered up some family members (including the niece <age 4> and nephew <age 8>) and headed to the Border Grill in Mandalay Bay for lunch. The restaurant is HUGE and spans two floors plus an outdoor patio. K and I were delighted to see that their specials menu included the quinoa fritters and tomatillo ribs that were part of chef Mary Sue Millken’s recent appearance on Top Chef Masters. We’d recently tried our hand at both (ribs here and fritters here) so we ordered the fritters to compare our version and the restaurant’s (we weren’t hungry enough to nosh on ribs sadly). The quinoa fritters were crispy and nutty and delicious, crispier than ours, but we don’t have a deep fryer. The Border Grill tortilla chips are hot and plentiful, with a sweet tomatillo salsa and creamy guacamole. After filling up on chips and quinoa fritters, no one was even hungry for the main entree, but I gamely charged through two small grilled fish tacos (good, but nothing to cheer about) and K made it through about half of his beef taquitos. It was very good upscale Americanized Latin food. The service was slow and erratic. After we’d received our quinoa fritters, the server brought over a dessert menu. Upon seeing the confused looks on our faces, he paused with a slight deer-in-the-headlights look. We told him we hadn’t even received our entrees yet so he stammered something about making sure we saved room for dessert then sprinted off to check on our lunch. Mine was a brief visit to Vegas, but it’s always a delicious opportunity to check out some new food. Next year I’ll skip the cupcake and head straight to Jose Andreas’ hot restaurant Jaleo — where K went. Before I arrived in Vegas. And dined without me. Not that I’m bitter about him eating at the place I *really* wanted to dine at. Not bitter at all. P.S. We are huge fans of the History Channel show Pawn Stars which is filmed at a Vegas pawn shop. We attempted to make a pilgrimage to the Gold and Silver Pawn Shop to check out the joint and meet the Old Man, Rick, Big Hoss and Chumlee. There was a very, very long line in the blazing desert sun. K’s cousin and his wife went earlier in the week, waited in line and got in. They said it was a small, grungy pawn shop and the guys weren’t even there. Just an FYI if you’re going to Vegas and hoping to strike it rich pawning some of your valuables with the Harrison fam.